Calypte anna, more commonly referred to as Anna’s hummingbird, is found in very few geographic locations worldwide. Although limited to certain regions, they reside in many diverse environments and habitats including forests, suburban backyards, community gardens, open woodlands, grasses, parks, cultivated regions and chaparral (California Bureau of Land Management). A study published by The University of Chicago Press determined that Anna’s hummingbird can be located west of the Sierra Nevada Mountains, as they are often found residing in the large region stretching from Washington and Northern California down to Baja California (Beuchat et al. 1979). 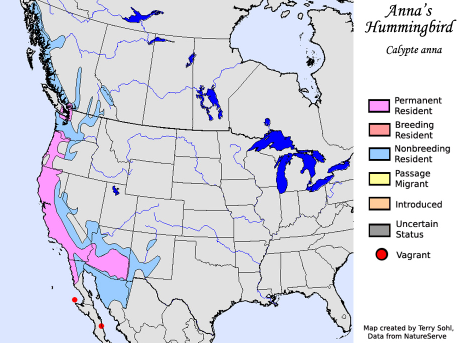 Furthermore, the same study recognized that Anna’s hummingbird has a larger migration range than any other hummingbird in California, and therefore they are considered the only residential hummingbird of California (Beuchat et al. 1979). These Californian mid-montane locations provide the Anna’s hummingbird with a desirable habitat, ensuring that adequate food supplies will be available and there will be plentiful resources for protection. (Clark 2009; Clark and Feo 2008). 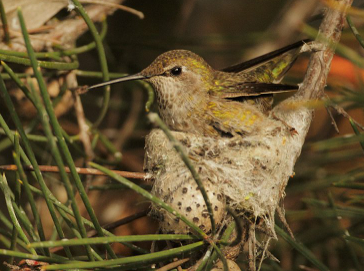 Traditionally, the Anna’s hummingbirds was thought and documented to only reside in parts of western California. However, data from recent years has proven and recognized that their migration patterns of Anna’s hummingbirds have expanded farther north into parts of British Columbia (Bird Web). This expansion indicates that migratory patterns allow for the hummingbird to adequately adapt to their changing environment and dietary demands. A study conducted by Springer in cooperation with the International Association for Ecology reported that hummingbirds remain in the same areas when their preferred food resources are available in their feeding territories (Copenhaver and Ewald 1980). By migrating farther north into new regions, the Anna’s hummingbird is able to adequately find and obtain more nutrients necessary for their diets. But migration purposes do not stop here for Anna’s hummingbird. Even though they are permanent inhabitants along the West Coast of the United States, Anna’s hummingbirds migrate to occupy different elevations throughout the year for reproductive reasons as well. Their breeding season, which spans from December to August, is spent in lower elevation territories. By migrating down along the coast of California, they are able to enhance their breeding conditions, which ultimately increase the fitness of their offspring. A study published by The University of Chicago Press determined that they migrate to elevations reaching 2,700 m during summer months and subside to 1,800 m for their breeding season (Beuchat et al. 1979). These lower elevation environments have sufficient food and natural resources for the hummingbirds to nurture and better protect their offspring. For these reasons, the Anna’s hummingbird is primarily found nesting in the oak trees, brush and shrubs of open woodlands and forests. It is here that they are able to build nests out of a combination of bird feathers, various plant materials and spider silk (Copenhaver and Ewald 1980). Return to Home Page Go to Adaption!